Similar to sit down dinner, family style catering service is an inviting and interactive approach to your event and allows guests to get a chance to get to know each other as they dine making it feel like the holidays creating a fun family oriented atmosphere. Wait staff bring out large bowls and platters of food, which are then placed on the tables for guests to pass and self-serve. Perfect for weddings and other personal social gatherings. PROS – All guests can serve themselves and begin eating at the same time. Fun and interactive for your guests. Like a buffet, guests can pick and choose exactly what they want on their plates. You can spread out activities (like dances and toasts) in between each course to keep guests engaged and maintain a nice energy throughout the meal service. CONS – Like plated dinner service, family style may require more servers and may result in additional staffing charges. Takes up more space on guest tables. Food costs may increase due to making more food since there are no restricted portions. Our raving foodie fans describe our food as “An oasis of deliciousness, delectable, mouthwatering, tasty, yummy a must have for your palate.” Living up to these expectations isn’t easy but it’s engraved in our recipe for our amazing food, day in and day out. We offer a variety of different catering menus and services to complement your once-in-a-lifetime event with BBQ food options starting from $12 per person all the way to formal dinners for weddings, corporate events and everything in between. Count on us to personally be of service to you. We’re very easy to work with and we’d like for you to feel comfortable enough to call us so contact us today for a quick free consult in answering all your questions. If you don’t see it on our menu we will make it for you. Organic USDA Gluten free options available upon request. Check out our CATERING MENUS below. 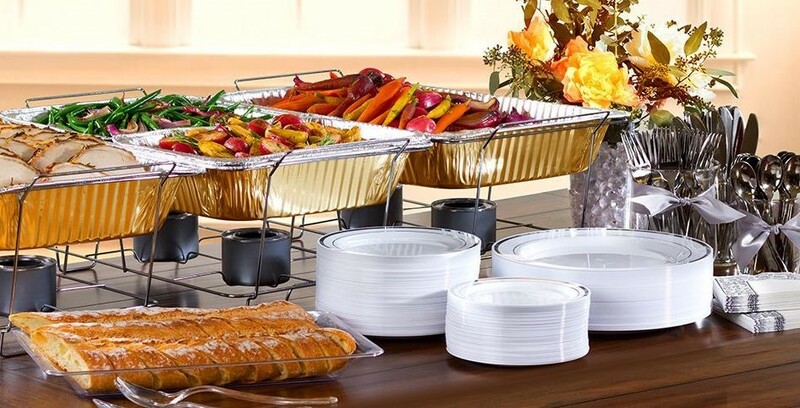 Buffet style is a popular option for weddings, corporate events and social gatherings with large guests attendance. 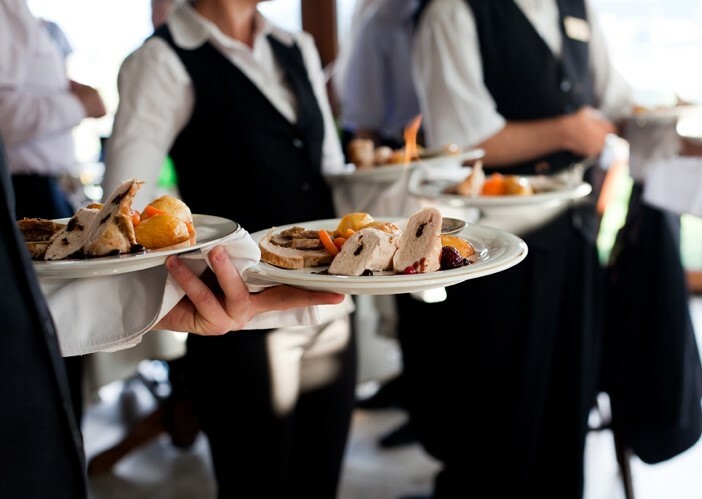 Even though it is a less formal option than a plated dinner service, your guests will have the opportunity to select their preference of food from the selection chosen from the buffet while allowing them to consider their dietary preferences and a chance to socialize while customizing their meal. Typically, multiple chafing dishes are set up on a long table with décor and guests are served by our waitstaff creating a catered presentation. 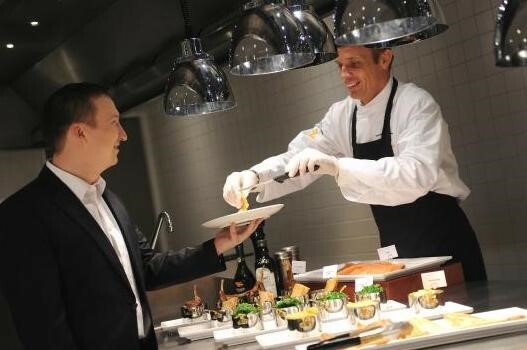 PROS – With guests being served at the buffet line, costs for wait staff are reduced. The right balance of protein and vegetarian dishes will typically satisfy all guests, including any with special allergies and dietary restrictions. CONS – Not all guests will be able to eat at the same time. Because of this the time for dinner service may run just a bit longer. Our BBQ service is perfect for casual corporate parties, family parties and social gatherings large and small. We provide onsite grilling, delicious meats and freshly prepared sides. Our traditional BBQ package starts at $12 per guest and it includes freshly made sirloin hamburgers and hotdogs accompanied with chips, refreshments. We also have tons of other add-ons and options like shirt steak, baby back ribs and so on. 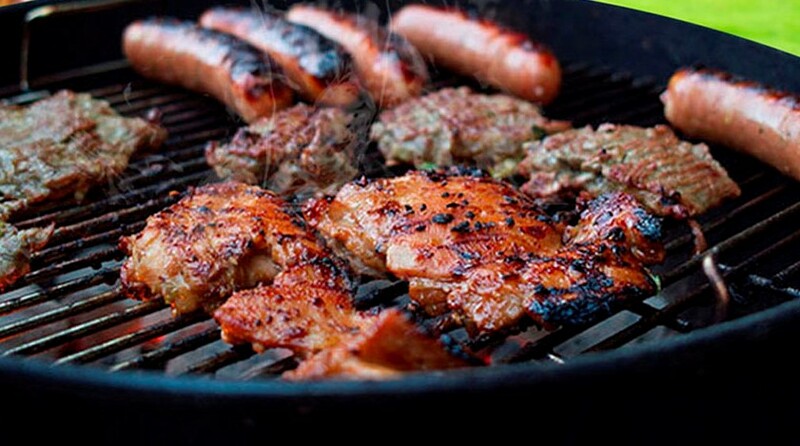 PROS – BBQ catering is always a fun experience for any occasion large or small parties such as pool parties, children parties, company picnics and everything in between. Onsite grilling provides food that is hot off the grill and tasty. BBQ’s are very social, relaxing and affordable. CONS – Absolutely no Cons at all! Kids can be finicky about food but we know what they like. All your kids favorite menu items are available on our delicious kids menu including hamburgers, hot dogs, french fries, etc. Check out our sample menus below and contact us for our complete menu options. PROS – Kids will immediately recognize our delicious food options and will pick and choose their favorites to eat while socializing with their friends. Our kids menu is appealing for children of all ages. CONS – No cons here, parents might want some extras for themselves! 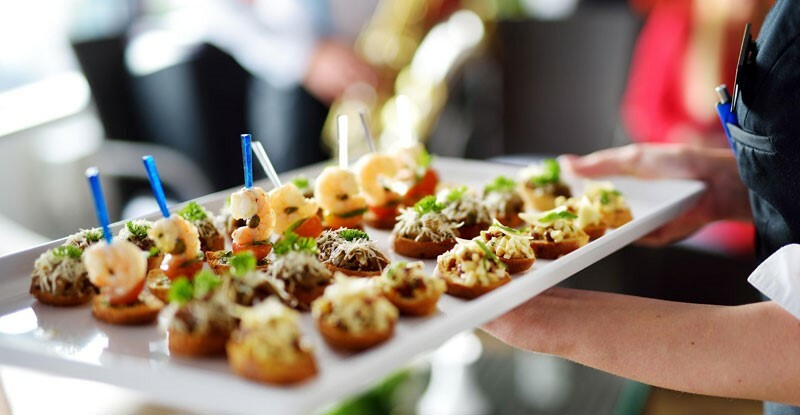 This style gives an elegant touch to your event with a beautiful presentation offering your guests to taste and sample delicious hot and cold gourmet Hors d’oeuvres that are passed around by our waitstaff. It’s perfect for smaller events, especially those of a more personal and festive nature however, it is an essential component for weddings and corporate events before dinner is served at the reception. It’s the perfect ice breaker to allow your guests to socialize and mingle. PROS – Cocktail service is great for events of all sizes and makes it easy for guests to socialize in a relaxed and fun environment. Food costs are typically lower when compared to other meal catering options. CONS – Although food costs would be lowered, alcoholic beverage costs tend to be higher when compared to other catering styles. 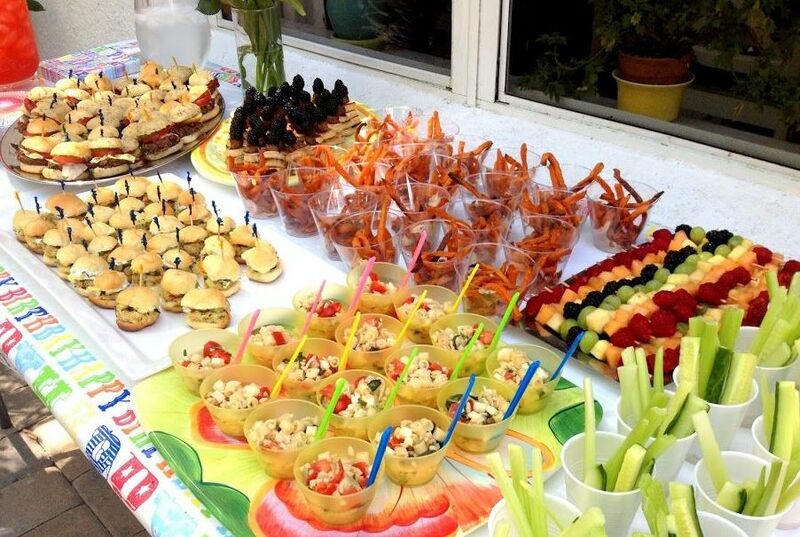 Food stations are very popular in both social and business gatherings. The variety of stations brings a lot of culinary excitement to an event since guests can move around the event, looking forward to what’s next. Like a mini buffet, your guests can mix and match from any station, creating their own personal dish. Some food stations have cooks freshly prepare and serve their meal on demand allowing your guests to personalize their dish from our exciting selection of food options while they network and socialize. A variety of culinary creativity options are available such as tapas station, pasta station, carving stations and more. 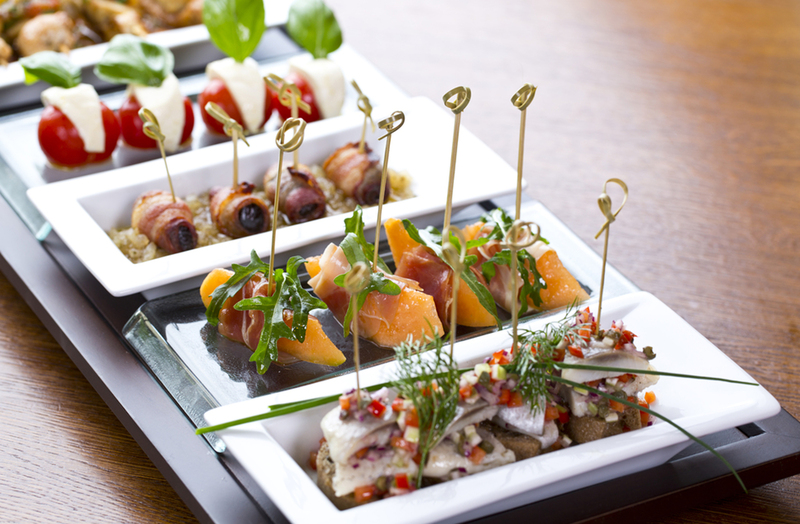 Food stations are always exciting making your event more memorable. PROS – Food stations are fun and always a big hit adding excitement to any event. Our cooks will assemble dishes allowing guests to choose ingredients and preparation. Food stations allow bring a higher degree of creativity when it comes to serving dishes. CONS – You may need multiple cooks to prep and serve at each station. Food stations can have higher food costs as people tend to consume more. 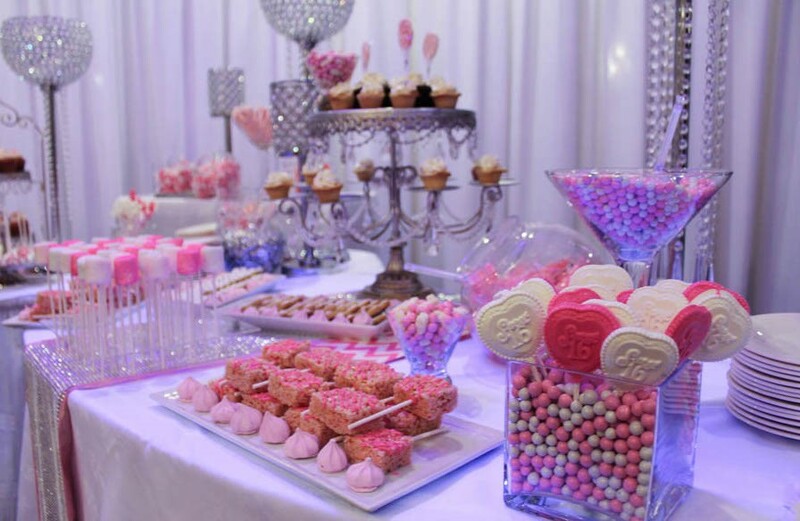 One of the best ways to incorporate your party’s special theme is with a beautiful dessert station or candy buffet. Our designers will elegantly tailor a delicious experience of impressive interactive candy and dessert stations that will wow your guests, making them feel they’ve arrived at a very special celebration. We offer a variety of sweet packages for groups of all ages and sizes. In addition to candy and dessert stations we also offer a host of station designs for donuts, ice cream, chocolate fountains and more. Talk to one of our event professionals today! 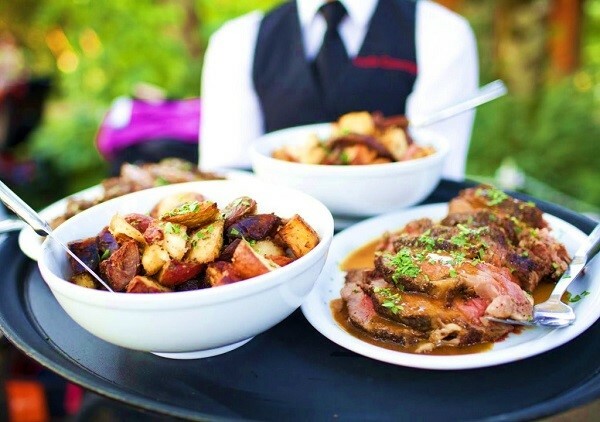 Plated dinner service is traditionally the most popular catering style for formal events in which your guests remain seated while their meal is served individually by our wait staff, just as it is served at a restaurant. You can either select protein options for all of your guests or ask them to make a choice of their entrée at the time they RSVP. Our culinary team plates your food just before it gets served. Plated service is very personal, making it a favorite for formal affairs. PROS – Guests are served fast and at the same time, allowing you to better manage the time for dinner service. You can also collaborate with our catering staff over menus. 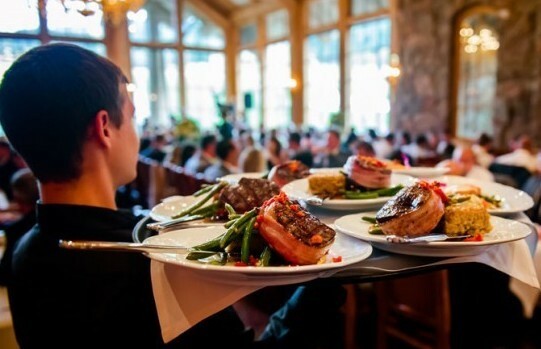 CONS – Plated dinner service requires more wait staff and servers to pre-set tables, plate up the food and clean up. Our professional staff of waiters and bartenders are known for exceeding our client’s expectations by going beyond what’s required and delivering great results. From set up to clean up let us take care of everything for you. Enjoy a variety of delicious menu selections at your upcoming event with our drop off catering service. We exceed our clients expectations by consistently delivering delicious food, outstanding service and timely delivery. Customized menus are also available. All necessary disposable aluminum trays, sterols, quality plastic plates, napkins, utensils, are included. Wait staff service and rentals for china, flatware and glassware can also be provided upon request. PROS – Drop off service is great for informal functions like company picnics and family gatherings. Drop off service is inexpensive. CONS – Although costs can be lowered, some aspects of quality may be affected once catered order is dropped off such as the quality of presentation and food temperature.